A while ago I decided that I needed appliance covers. There is a small dust issue out here and unfortunately it settles on everything. 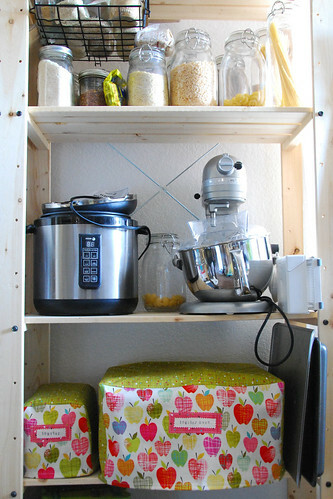 I like our open shelves (from Ikea), so covers are the solution. 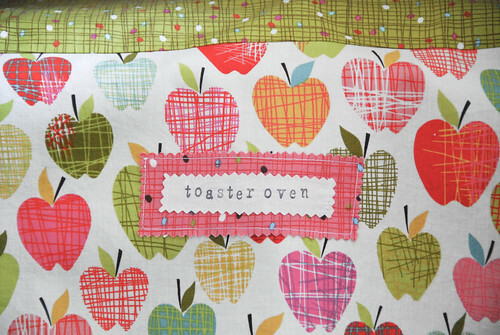 The hubs loves this apple print (I'm always amazed when he expresses interest in fabric!) so I grabbed 3 yards from JoAnn, plus a few yards of coordinates. These are not "fancy" and so far they have gone together easily. The mixer and pressure cooker are going to be much more complicated methinks. I love these!. I used a great tutorial for a mixer cover! I have a picture of it in my photostream. I would make it a tad smaller than the pattern unless you have the largest size mixer. Love your fabric choices. These look great. Good idea too - I've never heard of such a thing! Nice work, I like your use of the fabrics and the labels. You've inspired me to take off the flour towels covering my appliances and make some pretty covers too. Love how tidy the covers make your storage look. I may just have to try this!